When you see the Thames flowing past through Westminster, past the Houses of Parliament and on under Tower Bridge, it is difficult to imagine it starting as a trickle at some point. There are two of these start points, one is at Seven Springs, in Glucestershire, where you have an area you can easily visit, walk down a stone staircase, and see the Seven Springs bubbling all year round under a canopy of trees in to what is little more than a giant puddle that then disappears through a pipe under the road, and into a small lake. The second start point is out in the fields near Malmesbury known as Thames Head, (also in Gloucestershire) and at one time in history had a spurt that came out of the ground, and when I visited it many years ago had a statue of Neptune by it, but was a trickle in the winter only and dry in the summer. I am told that this site is dry all the time now and that some water does come from a small spring further down. The statue of Neptune has now been moved to the lock near Lechlade in Gloucestershire, within a couple of miles of the head of navigation, as far as you can take a cabin cruiser on your holidays. Seven Springs is further in terms of total river distance by 14 miles and as the crow flies, than the other source. The Thames is Britain's longest river, said to be 229 miles. At Seven Springs water flows all year, while at the other location its only for parts of the year. At Seven Springs there is a large layby and quite a few stop here for break not realising that in the island between the layby and road lies the start of the River Thames. From the layby look for a series of steps leading down amongst the trees, and following this you get down to the place where you can see the springs. 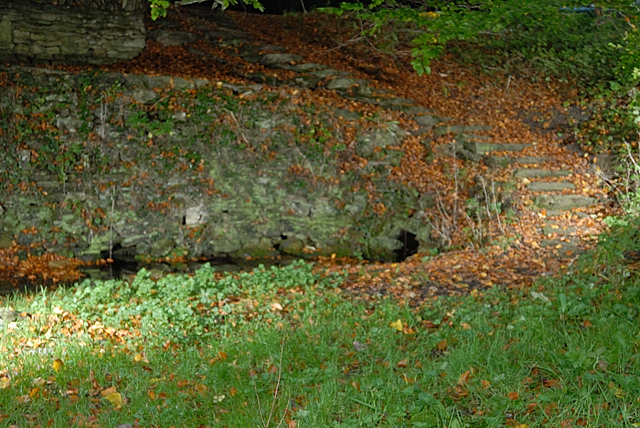 A stone wall runs behind the springs and around to hold up the road, although there is a large verge and trees as well. On the opposite side of the road is a 'Hungry House' pub come eating place and from a part of its dining area you can look over the lake that the water runs into, having passed under the road. If you visit and see the clean cool water bubbling from the ground, its difficult to imagine that this water will have been through eight or so people and back through treatment plants before being used again, before it gets to London. As you may know nearby Cheltenham is/was a spa town, so was at one time particularly well known for its waters, however Seven Springs was not developed like many of the springs within the town. Stone at Seven Springs, translated I am told this reads - "Here, O Father Thames, is your sevenfold Spring". Getting there: From the junction of the A435 to A436 south of Cheltenham take the A436 towards Gloucester, within a very short distance you will see a layby on the right, park here. Access: from a layby, there is a sign but its often not visible due to long grass etc. Opening Times: open at all time, not fenced.